Radiant floor heating is becoming more and more popular with each passing year. And, for several good reasons. For starters, getting a standard or a tankless water heater for radiant floor heat can be an incredibly economical move, and it will end up saving you a lot of money. Also, if that wasn’t enough, water heating is incredibly convenient and capable of distributing the heat perfectly evenly. And, lastly, if you have ever been to a home that uses radiant floor heating, you know how good it feels. The simple fact that the floors are always warm is one of the best things you can experience during a cold winter. And, if you are aiming for that incredible heating experience, you are probably wondering which heater you should get. 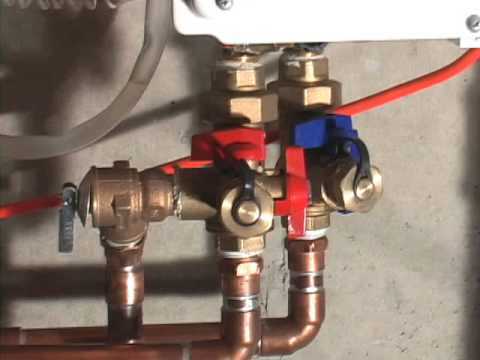 Well, tankless water heaters for radiant floor heat are probably the best way to go in our opinion, for various reasons. Let’s quickly go over the advantages of a tankless heater when you compare it to the standard one. First of all, tankless water heaters work instantly. That means that you don’t have to have them running non-stop. Instead, you can turn your water heater on and get the hot water when you need it. Additionally, all of the modern tankless water heaters have excellent temperature sensors and heat exchangers. Those sensors work with the heater’s computer to prevent overheating or underheating of the water. And, that allows water heaters to accomplish tasks that standard heaters simply can’t. Furthermore, if you do the radiant floor heating system design well, you can manage everything with your home’s thermostat and significantly cut down on your energy expenses. Of course, the next big question is probably going to be about finding the best tankless heater for yourself. Well, to help you out with that, we have made a short list featuring our top three tankless water heaters for radiant floor heat. Believe it or not, some of the best water heaters come from Japan. And, the Takagi T-KJr2-IN-NG is no exception. After all, Takagi is a Japanese firm that tries to build and maintain their reputation. To do that, they are making excellent water heaters. But, let’s focus on the heater. Straight out of the box, the first thing we have to notice is the size of this device. Takagi claims this is the smallest water heater they can make, and we have to say we believe it. The dimensions are 6.7×13.8×20.3 inches, and it weighs in at 38 pounds. That is mostly impressive because it still puts out a lot of hot water. Namely, this powerful machine puts out around 140,000 BTU. And, it does so while pumping out up to 6,6 gallons of water per minute. Thanks to that, this heater effectively simulates the output of a 40-gallon standard heater. And, if you have ever seen a 40-gallon heater, you know how impressive that is for a device this small. So, if you don’t have a lot of extra room in your home, but you want to get a hot-water-on-demand system, this unit is the one for you. This Takagi’s heater also boasts an excellent temperature check system. It works by having water pass through thermistor chambers. They keep the tab on the current water temperature. They notice any oscillations and possible issues. So, if the water temperature crosses a peak limit, the water heater will shut down automatically. Another sensor many consider crucial is the air to fuel ratio sensor. That sensor makes sure your heater does not output harmful pollutants into your breathing air at alarming rates. Of course, those are not all of the safety measures. Other safety features include the surge breakdown protection that will keep both the machine and your house safe. Also, it comes with freeze protection and various other safety features. However, you should bear in mind that the installation might be tricky. After all, this unit works by burning gas. That means that your water heater will require outside venting. So, we wouldn’t recommend installing this heater without professional help. Well, unless of course, you are very capable when it comes to DIY projects. And lastly, we have to mention the warranty Takagi offers with this device. Namely, the heat exchangers come with almost unbelievable ten years of warranty. All other parts are under warranty for five years when it comes to residential use. Just make sure to get a licensed technician to do the installation. We couldn’t make a top list of water heaters without mentioning Ecosmart. Overall, it is one of the companies that strive to provide the ideal user experience. And, Ecosmart 18 is one of their best electric tankless water heaters for radiant heating. Now, this electric heater is not as powerful as the Takagi, but it will supply more than enough water for an average home. But, first, let’s quickly visit the unboxing experience. The first thing that you will notice is how light it is. In overall size, this heater is about as big as the Takagi. The outer dimensions are 19.8x16x6.4, but the weight is only 14 pounds. And, that makes it a lot easier to install. However, once again, it is not as powerful as the Takagi T-KJ2-IN-NG gas floor heater. In fact, this machine will heat up around 2.5 gallons of water per minute. In our experience, that is about enough to run a dishwasher and a shower at the same time. Unfortunately, if you are a part of a bigger family that lives together, this heater is probably not enough. Of course, if you live in a warmer climate where the typical water temperature is above 70 degrees, you can run two showers with no issues. When it comes to installation, you should make sure to have the minimum panel for it. Namely, it requires an electrical panel that supports at least 150 amps. For plumbing, you should stick to three-quarter inch NPT connections. But, back to the size for now. Here is the thing – if you live alone in a small apartment, this is the best device for you. It doesn’t take up any space, especially if you compare it to a traditional heater. The next feature we would like to talk about is the high-tech control module. You can adjust your water temperature to perfection with little to no effort. In fact, you don’t even have to do it yourself. The system has the capability of self-adjustment according to the requirements. And, of course, one quick look at the digital display will show you the current settings. It’s no surprise that we are love Takagi’s heaters. After all, they are outstanding pieces of heating equipment. And, the T-H3-DV-N came to be as an upgrade to the previous unit we spoke about. That means that this unit can handle much more in terms of heating. However, it is definitely larger than the T-Kjr2. Namely, the outer dimensions are 11.2×17.8×25 inches, and it weighs in at around 60 pounds. But, it does come with several benefits. First of them is the fact that it boasts an incredible water flow of up to 10GPM. Also, it provides that flow and heats with the maximum gas intake of almost 200,000 BTU. Naturally, we also took a look at the safety features. They include the overheat, surge and freeze protection, just like the previous model we spoke of. Also, this device offers troubleshooting to the user. And, the warranty is even better than the previous one. You get an amazing 15-year warranty for your heat exchanger. In the end, the choice is all yours. However, if you are looking for a tankless water heater for radiant floor heat, these are the best choices you can hope to find. Our editor’s top pick is definitely the Takagi KJr2 due to the versatility it offers. However, you might prefer the energy saving potential of the Ecosmart or the raw power of the H3 over it. We hope our reviews will help you make your decision.